When a film takes a while to come about, the results can range far and wide. Troubled production, difficulties among certain cast members, a long gestating story, re-shoots and disastrous previews were all aspects that surrounded George Miller’s return to his Mad Max franchise like a Tornado. So when Fury Road finally looked to be on the horizon, the hype was both hopeful and at the same time tinged with cynicism. Acting as much as a reboot as a sequel, this franchise rejuvenation could realistically have gone many ways. Thankfully the only way is up with Max Rockatansky’s return to the big screen proving that “we don’t need another hero”. Mad Max: Fury Road is not just a work of fun; it is the rocket up the backside of mainstream action cinema, which has been sorely needed. 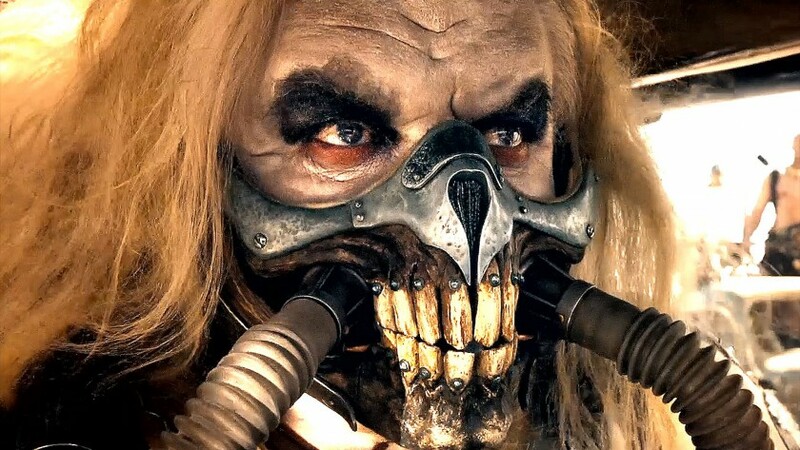 Taking place in a sand strewn dystopian future Australia, the film sees Max (Tom Hardy) captured by the forces of a tyrannical cult leader called Immortan Joe (Hugh Keays-Byrne). However Max soon finds himself as an unwilling associate of warrior Imperator Furiosa (Charlize Theron) who has defied Joe, by smuggling his breeding women out of his clutches. With Joe’s forces hot on her heels, Furiosa must rely on an uneasy partnership with Max to help her accomplish her goal of freeing these prisoners and finding solace in a place known as “The Green Place”. This simple story advances the primal nature of the film forward but beneath all the twisted steel and explosiveness; there is a cerebral tale of liberation and overthrowing tyranny. There is just something about this occasion that feels momentous – perhaps it is the film’s stylistic similarities to an 80s action/Fantasy epic, the sky-high standard to which it engrosses us in it’s post-apocalyptic world or perhaps it is just how different Max is from the usual mega budgeted fare driving into the multiplexes. Seeing Mad Max back onscreen was always likely to be fun but Miller’s film is awash in hard work and exemplary craftsmanship. The action thunders along without ever letting up (literally 90% of the film is essentially a chase) and the practical effects and stunt work are among the most stunning you will see in any film. The vehicles are interestingly designed, as are the characters and the imaginative set pieces, all of which combine to make the action ballsier, feistier and occasionally nastier (as the film’s 15 certificate denotes). Mad Max: Fury Road lives up to its title. It is a furious film, which fills the screen with activity in every moment and boasts pure unbridled but glorious chaos. At 70 years of age Miller shows no sign of losing his aspirations to go bigger and despite the fact his film is very primitive in terms of dialogue and narrative, this in many ways adds to the senses assaulting B-Movie like demented intensity of the picture. Like the franchise’s most revered instalment Mad Max 2: The Road Warrior before it, Fury Road is a film not bothered by articulation and yet as previously mentioned it speaks volumes, should you look beneath the cinematic chassis. The feminist aspect is unmistakable and the film is about objectification and breaking free of it, while also showing how one (no matter how weak) can rule all, should they have fear as their ally. Using many powerful images to denote a few factors, this could pass as warped art on many occasions throughout. Fury Road is a throwback of an action picture that may tear up the screen with flaming guitars, bullets, freak storms, named tumours and lightning fast vehicles; but it has a brain behind the brawn and possesses something even rarer, a director who is unchained in presenting his vision. However one aspect that cannot be overlooked is that of the acting and the remarkable thing here is that very little (what many would call) traditional acting takes place. This is a physical film with performances to match. Hardy is a fantastic choice as Max and while not openly charismatic and rather restrained in the part, his performance is similar to Gibson’s performance in The Road Warrior. Hardy’s Max is a loner, plagued by the past and the present all at once; but beneath his grit, the film eventually gives us a peek at the heart of the man lost to the madness that surrounds him. Nicholas Hoult offers great support as one of Joe’s cultish (and sandwich short of a picnic) followers, named Nux; and the film boasts a truly horrific masked villain in Immortan Joe (played brilliantly by Keays-Byrne – whom fans will know portrayed antagonist Toecutter in the original Mad Max). Joe is a literal monster and his introduction onscreen is unsettling, as are his monstrous actions. However the strongest performance is that of Theron who is sensational as Furiosa, an action heroine to remember and root for, one with a mission, a backstory and a steely determination clearly present. Theron gives the part emotion and nuance as well as ferociousness and fortitude. So after all the dust has settled, after all the issues, concerns and troubles and after 30 years, finally the franchise has gone Beyond Thunderdome and this trip down Fury Road has been worth the wait. George Miller has crafted a unique big screen experience in a time when many criticise the lack of difference in the mainstream output of cinema. Mad Max: Fury Road is unrelenting and aggressive and yet deep, entertaining and crazier than a rabid mongoose. This is the kind of film that makes you happy to be a part of the film-going community and even those who are not keen on the warped humour or delightfully bizarre cinematography, cannot argue that this film is not passionately assembled and truly a triumph of vision. Gratifying for those who are left at a loss by the superhero influx in blockbusters nowadays and certain to satisfy franchise fans as much as newbies, Max is back and better than ever.